RENO, Nev. (March 20, 2017) – Imagine if, one day, life drastically changed and suddenly, being extremely wealthy is the new norm. This is the focal point of “The Wrong Side of the Blanket,” a new novel from Reno-based author Jennie Gilbert Ross. ‘Blanket’ follows Manuel, a young man living contently in Mexico with his mother, a peasant. His father, whose identity is unknown to Manuel, is a wealthy land owner. Because of the life differences, the relationship between Manuel’s parents is strictly forbidden. The identity of his father is unknown to Manuel until his mother’s death. Once he discovers who his father is, he also discovers an entirely new life. From there, Manuel struggles to combine the two parts of his life into one. 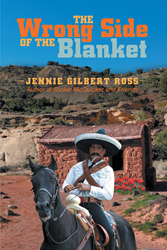 Ross was inspired to write ‘Blanket’ after visiting Mexico, both old towns and new. She became acquainted with several people, both of wealth and poverty. In addition to being a fan of history, Ross began writing. A powerful rag to riches story, “The Wrong Side of the Blanket” follows one young man as he struggles to incorporate his new life into his old. Jennie Gilbert Ross is a self-published author of more than three books. Ross currently lives in Reno, Nev. with her husband, two dogs and two horses.